Apex is incorporated in 2004 and have provided reliable services to our trusted clients since. 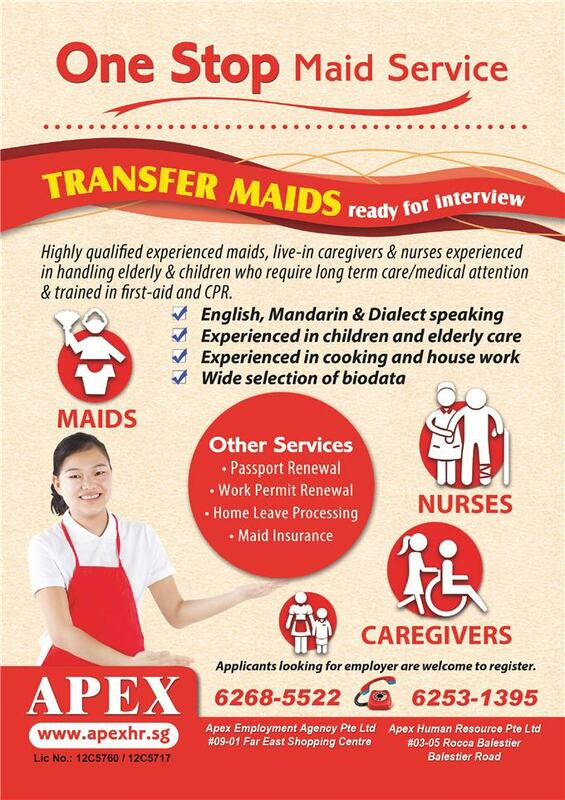 We specialize in sourcing for professionals, nurses/caregivers as well as maids especially from Philippines and Myanmar. We provide a wide range of bio-data specially catered to your needs. Many of our maids are familiar with local dialects and experienced in care for children. We also provide specialized, live-in caregivers & nurses who are experienced in caring for patients who are bedridden or wheelchair bound. We strive to ensure 100% customer satisfaction. We are your one stop employment agency. We provide passport renewal, home leave processing, work permit renewals and foreign worker insurance.